As 2018 is started we will get to see many more great movies like we saw in 2017. Many big movies are on their way to release. Saif Ali Khan is bringing Kaalakaandi. 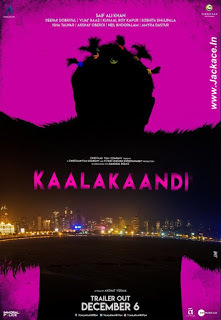 Kaalakaandi is a comedy film. The movie is scheduled to be released on 12 January 2018. Directed and written by Akshat Verma. The movie is produced by Rohit Khattar and Ashi Dua. basically, the movie is all about disastrous things happening with Saif Ali Khan as Kaalakandi means bad things in Marathi. The first song of the movie Swagpur ka Chaudhary has been released on 23 December 2017 and the trailer was out. Fans are excited about the movie and loved the trailer. Next trailer is not out yet as Saif Ali Khan is enjoying the vacation with family. Next Trailer needs to be edited and without Saif, it cannot proceed. movie’s budget is predicted to be 40 crores and it needs to cross that margin line to be a hit. it is not clear till now that Kaalakandi will be released on how many screens but soon it will become transparent. Akshay Kumar is coming with his new movie PADMAN, which is gaining so much popularity without many promotions. Kaalakandi will get to see competition with Padman and we will see who will win hearts of the audience. We will keep you updated with all latest box office collection of Kaalakandi once released !!! What is wrong with this star nawab sir?. One of the most successful her of era 2000. Many fans are upset. true Prit Dixit, Saif Ali Khan was so successful but maybe now he is not able to choose the right script. No doubt he is doing hard work for his performance.